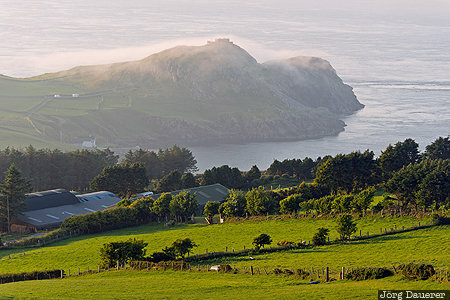 Mist over Torr Head surrounded by the calm Irish Sea at the causeway coast illuminated by warm evening light. The Causeway Coast is in Northern Ireland, United Kingdom. This photo was taken in the evening of a foggy day in June of 2016. This photo was taken with a digital camera.